The night and the market devour her. They swallow up her unicorn bones and her scales and her brittle fragile flesh. The night eats away at her with shadow, peeling away the fresh-grass smell of the spring and the pollen coating her like gold dust. Each step through the market cuts apart her silence and her dreaming gaze that's often neither here or there but between. This place devours her and it spits out something else after the feast of her. Here Isra is almost lovely, almost golden with a halo of firelight brushing at all her gaunt and dark edges. That wicked spiral of bone upon her brow seems a crown. A single lily (one of the first of spring) tucked behind the delicate tower of her ear seems brighter than any diamond or precious stone. There is nothing particularly queenly about her, nothing grand beside that firelight, horn and flower. She's dark against the rainbow of silk draped above her head like a sky hung on ribbons of comet tails. Around her others are dressed in gold and glitter and their bodies seem like holes chewed out of the darkness and filled with moonlight and starlight and light. And, she is the smallest burst of skylight out of them all, dark as night with only those three holes chewed out and filled with light. So even the merchants devour her, eating up her space with their bodies until she's bathed in the scent on them. Her hip smells like clove where a spice seller dropped his bucket and it the granules of his wares rose up like paint to cover her darkness with something else but black. Sage smoke clings to her neck from when she passed to closely to a fortune teller. Isra ducked her head and quickened her step there when the shed-star looked her right in the eyes and said, He's coming. He's here. The fire-glow laid bare her uncertainty until that too was chewed up in the endless press of the market. It takes walking around a corner for her to slow her steps, to settle her feral, wild heart from beating so furiously it took flight over the sea of her skin. Here when she lifts her eyes up towards a ray of moonlight and silver she imagines her skin smells like dust and ice instead of smoke and spice. Isra cannot help but sigh and close her eyes, afraid that she slumbered in a bed of sage as the shed-star chanted prophecy and carried her away into a dreaming sort of death. Bits of white spark in the darkness when she presses her eyelids together like snowflakes bursting over the darkness in a blizzard. In that darkness and snow-white she quivers, afraid to open her eyes. Isra has never been afraid of dreaming, of walking in that half-there world between stars and glass and slumbering bison. But oh! Oh! She is afraid now. He would search day and night but of course, in the end it was she who found him. He's heard her name in the streets, pinched it from the thoughts of strangers, but when everyone says Isra it sounds different from the sound his heart makes. It does not really click that his Isra and the sovereign Isra are the same until he sees how the night air bends around her like something beloved, until he says her name out loud and on his lips it sounds the same as how the others said it-- "You're queen Isra." In the moments of calm between wild thoughts, he remembers how the snow melted on their skin, forming rivers in the warm canyons where flesh pressed to flesh. Meanwhile his magic rages inside of him, wanting to swim with her mind once again, to do what the light does with her skin. She looks a little more solid in the firelight, a little less like a dream. Eik reaches out and rests a telekinetic finger on the flower behind her ear (beautiful), then lightly traces the curve of her cheek (also beautiful). He withdraws the ghost touch and takes an uncertain step forward. It was different before, with only the bison as witnesses. Now she is a queen and he is a diplomat and the market is staring (they must see his heart seizing in his chest, they must be laughing to themselves) or maybe not paying any attention at all-- anxiety and paranoia blur the details sometimes. He is painstakingly careful with his words. Instead of "come swimming with me," he says "You have a beautiful home," and although he means it the words are just a placeholder to keep himself from blurting out all the other things he wants to say. His dark eyes hardly blink as they try to drink her in, afraid she may vanish the moment he's not looking. With extreme restraint he takes a single step forward, nose extended in greeting. He is close enough to smell her skin now, beneath the sage smoke and the market smells. His entire body sings with how near and far she is. "Do you have time to walk with me?" His voice is coarse with things unspoken. He feels terribly inadequate, dressed as he is in dirt and scars, but he can't stop imagining what it would be like to be the smoke in her hair. He calls her queen and she starts to climb out from that trembling dream of fear. Each of his breaths is a stair, diamond bright and glass slick. His telekinetic touches are walls made of emeralds, moonstones and sapphire that tower around her and feel like satin when her belly brushes against them on the upward climb. Eik is a castle of dreams and she trembles through the bright halls of him while her darkness and fear and doubt nip at her heels like wild, hounds of hell. When she opens her eyes her lashes whisper upon each other and the smoky air like bird feathers praying against each other. They feel heavy, almost as if it's slumber he called her from. It feels as if, when she blinks, it's glittering dust of dreams that trickles down her cheeks instead of the desert-sand of nightmares. “You were real.” The smoke drifts around her words like silk around the wind and it grows as wild as a snow storm when she lurches to close the distance between them. She's almost feral, this Isra of the waking world who has shed the dreamy bravery of a snow coated night. “You are real.” It comes out like a wondering, lazy start of a tale. Each word falls from her like the start of something, as if everything before now was nothing more than a draft, a sketch of words on fallen leaves instead of paper or stone. Isra wants them to be writ on stone, deep enough that the wind of a million winters could not scratch out a single curve of their letters, their words, their story. The last step between them is less lurching, less wild and needy. Isra forces herself to care that others are watching, to swallow down her own reckless need. Perhaps if she knew that he is more than the gray stallion of the snow she would have never lunged towards him at all. Perhaps she might have cared, or perhaps her unicorn bones would have cared little and only wanted. But all the perhaps and maybe float away like the smoke and like her fear when they touch. Now there is only fire, only dream-need and she opens up her mind like a rose (and like a pit of quicksand) and silently her mind promises. Drown and I will drown with you. And her lips whisper like blown away dandelion seeds across the bold plane of his cheek. “It is more beautiful now.” Isra lets the words blaze like a secret between them, a dreaming sea only the two of them could sail. Overhead two small dragons twine lazily together their paths of flight and the moon glints off their wings like glass. He flicks his ears uncertainly, caught off guard because for a time he thought she was not real. He had learned the truth when he looked through the eyes of a crow and saw the twist of her horn gleaming against the stone streets of Denocte. Maybe he should have sent a message before his arrival, but it had not occurred to him that he would have seemed a dream. It doesn't matter now anyway. They stand before each other once again, this time more knowing. "You are real." His heart is a hummingbird in his throat."Yes." When her mind blooms it nearly breaks him. He dreamed of her for nights on end but his dreaming mind could not compare to the intricacy of her waking one, not in a thousand years. He doesn't want to drown, he wants to swim. He wants to want to swim. "It is more beautiful now," her breath is a song, and heat rises to his face where her words tickle his cheek. He looks away sheepishly, and he sees the small dragons twine together above them. Briefly he wonders what it would be like, if they were dragons. "Are you afraid?" He asks silently, as he wraps his mind around hers, cradles it for a sweet moment. She sets his magic on fire-- if it had its way it would sink deep down into her and seize her memories and her stories and her essence. It would learn what color is the core of her, beyond titles and circumstance and history. He holds himself back because it feels like a dangerous thing, somehow, like stepping through a door from which you can never turn back. The effort it takes to pull away almost steals the breath from his chest. He does not want to consume her. Not in that way, not here or now. He thinks of snow and buffalo and the quiver of her voice when she demanded his name. He had enjoyed being commanded, the clarity of it. She asks her question now politely, as he had just politely asked if she had time to walk with him. Briefly he is overcome with longing to be alone together, to make demands of one another. Instead he swallows and inclines his head, and they politely begin to walk through the night market. He had expected her to lead him but if she does it is almost imperceptible. It seems more like they lead each other, if it is even possible to lead when there is no destination. "Your home is so full of life and sound and color," he leans into her gently, so that his quiet voice may be heard over the market sounds. "Magic and mystery. It feels like walking through a dream,"
He is quiet for a while after that. Words don't come easily to him, at least not the right ones. It takes time to sift through the silt, piece together what it is he really wants to say. Time has an indistinct quality here, as it should in a dream, measured only by the brush of flesh on flesh as they sway into each other then away again, two souls adrift in a vast ocean. When he speaks again it is as though he never stopped. "like here I could be anyone." His smile is small and a little sad. This pause is much shorter than the last-- his mind was never good at lingering himself. "Everything here reminds me of you in some way, even the marks the ocean left." Later he will realize how quiet (not silent) his demons are against the sound of steel on stone. Not anymore. She answers him with swirling ripples of that dream sea between them. Her words are sails, silk and sea-foam satin that strain and sigh against that whiplash of wind made by their wants and their dreams. The brush of their skin feels like both her hull an her anchor as she sails, adrift on that sea awhere she could drown in him. Dive deep, Isra's wants whispers in satin and straining ropes, dive deep and we can walk together on the bottom of the sea. We could find the core of everything. And when they walk between the fires that dreaming sea turns golden and molten and the fire feels cold against the heat between them. Isra sighs into that heat and leans her cheek against his as they move. She wonders at the way it's an easy gesture to make, how pulling tight the ropes between their ships is as easy as breathing (as easy as being a unicorn). Isra follow Eik's gaze as if she is the tail to his comet, all the dust and debris left behind fire and light and beauty. When he says life she turns to watch a merchant laugh with his whole body between the arches of his stall that are still crusted with salt and seaweed. Sound has her humming along with a song sung by the children they pass. Her lips vibrate fiercely when she presses them into his mane when the song reaches its chorus. The furls of her mind brush against him too. They call to that thing in him that causes the thing in her to bloom and root in the soil of their ocean-bed like wire into flesh. Isra wonder what words he might sing to the tune of her lips, if he can sing at all. She wants to sing, and sing, and sing of tomes and tomes of stories and religions until the whole court is drowning in this dreaming sea of theirs. Her humming never ends as he talks, although she's still listening, so intently that her ears ache for listening to his words, his breath, his heart, the sound his hooves make on stone. And oh, oh, oh! Eik says dreaming and then mystery and her story-teller sails catch a breeze. Isra laughs, slow and sultry (although she has no idea that huskiness of her voice is anything but nerves and wants and almost-worry). The salt that's ever-present on her lips tastes like honey and gold as she brushes her lips across his brow, his ear, his nose, his lips. Dive deep, and deep and deeper. Her sea-foam sails say on that golden sea and the silence between them suddenly feels more alive with life than the night market could ever dream of being. He does not understand her fearlessness, but he remembers the plains where bison slept and how her soul called to him, and he remembers reaching out and tasting salt water, and teasing at the memories of death that played across the screen of her mind like an aurora. Dive deep... and we could find the core of everything. He does not understand her fearlessness but when he opens his mind it comes to him, seeping into his body from the earth and the fresh spring air and every touch of the night's queen body against his own-- casually, at first, as though brushing against her was a string of accidents, until the touches linger too long for coincidence. "Together." He asks, he promises, heart growing bold when she leans into him, cheek to cheek, and half his vision is consumed by the piercing blue of her eye. A blue so powerful it could bring a nation to its knees and so deep it could swallow a man. The thoughts of Denocte swirl around them like smoke. All the love and hate and fear and hope, hazily pulsing in tune to the melody that Isra hums into his neck. Isra, Isra, Isra, so sharply in focus that everything else seems fuzzy and far away, even time itself. Her laughter, honey and smoke, is a wonder in itself. It stirs something sharp in his belly that almost feels like pain. He leans hungrily into the sound and into her kisses, and if he were to close his eyes he would feel the water rising all around them, salty and warm as blood. Once Eik would have said "a man without a shadow," but that isn't quite right anymore. He isn't sure when he stopped running from grief, but the whole world is colored differently now because of it. In many ways we have come to be defined by our sorrow. It no longer follows us like a ghost but it lives in our chest, and for all the pain it brings there is also great comfort-- we feel its weight and know we are made of something more than dreams and dust, something heavier, more substantial than hope. And oh, how beautiful the world can be with a generous dose of sorrow! Beauty not just in magnitude (the unknowable depths of the ocean) but in nuance (the delicate curl of Isra's eyelashes). Surely her kisses are that much more moving for all the times he's been touched in violence instead of tenderness. When he finally speaks it is without hesitation. This is not the first time he's had this dream. "We would fly." They would fly and then they would dive deep, and the world would be without boundary. His muzzle finds the way to her mane and he breathes in as though drinking of the night itself. He feels a little like he doesn't belong in his skin but hers. He reaches up just a little further, and into one ear he murmurs "Isra," her name a beggar's song, the only song he's ever sung. It is a song of desire and confusion and sorrow. "What is it you're doing to me?" He opens his mind a little wider then, so she can see how it feels like his heart is resting in her gently closed fist. Isra does not feel as if she walks through the streets. 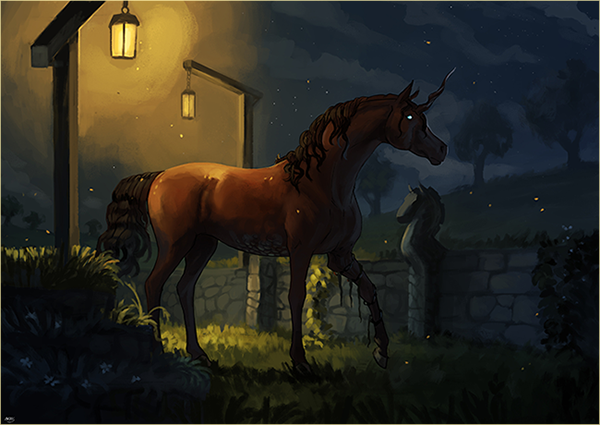 Her hooves do not feel as if they move and chime over cobblestone and across gemstone. The night does not feel like a silk blanket over her skin nor do the stars feel like distant constellations too far away to sing and offer warmth. The smoke in her lungs doesn't sting as it should, doesn't taste like ash when she inhales and lets it linger on her lips. Instead of walking she is swimming. The merchants circle about them like schooling fish and the moon arches over their head like a great narwhal (silver, black and sometimes dangerous). The cobblestones at their feet could be sand for how soft they feel beneath her. The gemstones, shining gold and amethyst, could be nothing more than lost treasures and sunken dreams that pale beside Eik. Each of the wooden arches of merchant stalls tower beside them like spirals of coral decked with anemones of gold, red, purple and blue that reach out their tentacles in the soft wind that rushes over them like a current. How lovely it is here, at the bottom of our mind-sea, in the core of us. Isra's sails slap against the current and form words that float around and around like seagulls between them. Can you feel all the ghosts of us that swim here like sharks? Isra calls or the birds call, she's lost the definition between her and the sea and the sky in this place deep, deep, deep inside them, between them, on them. I have never felts so different from them but I am! I am! I am! The words bubble up like brine between them and she wonders that they taste not like salt on her mind's lips but like wine. It's his touch that brings her from the rainbow dark of them, rays of his sunshine laid out before her like prayers of golden-light. Up, Up, Up. She rises and swims and folds back her sails and anchors in the middle of that pool of sunshine. Isra's ears still ache to hear his voice. Each of his words is a flame, an inferno, a star and she trembles and burns at the surface of their sea. “I would fly with you forever. To the stars and then further still than that.” Each word shivers in her lungs like a butterfly brushing softly against the cage of her bones, her organs, her skin. She wonders if he can feel them, if his magic can reach down into the soul of those butterfly words and find the million other words tangled into each syllable. Isra could make her own sea with the words she wants to say and fill it with fish made with bones of hope, scales of want and fins of need. When he opens up the shores of his mind Isra wades in and touches her horn to the water that could be his heart. She lays a phantom kiss against it and spreads wide her own rib-cage so that he might see the pulse and throb of her heart. It beats a song of sorrow and longing and something she thinks might be like desire (part of her still thinks desire means pain and death and hate). Isra is gentle with his heart and his mind as she wades back out to their shoreline and brushes her nose against his. “Is there a name for this thing we are doing to each other?” There is sorrow in her voice, heartbreak that she has no name for the butterflies and the summer sea rolling inside her. All the things inside her are as terrifying as they are thrilling and she wonders that words of stories seem a weak thing compared to this. Nothing she has ever read has prepared her for this. Will you teach it to me? Her mind-sea is filled with the question and her unicorn skin aches and throbs and burns. And her soul-- her soul feels like something else, something more. Her soul feels like a newborn universe. What a fantastical world they weave-- well, Isra is the weaver, Eik is the thread. I am! I am! I am! chimes her soul, and the gulls that swoop past with hearts that have only ever known the joy of flight. He is quiet, savoring the way her wonder feels indistinguishable from his own, and tries to remember this moment: the ring of her voice all around and the swell of his heart and way the world seems so, so large. And then the two are flying up and up, until their wings glitter with frost in the moonlight. The world below looks so delicate and so impermanent from up here-- it becomes clear how their lives are just grains of sand on an endless beach. "Together," he promises for the second time tonight, although that word she used- forever- catches in his throat and drifts back to earth, lazy as a feather waiting to be blown by the breeze or caught and treasured. It is not a sadness when he returns to his body, for he breathes in the smell of her with as much wonder as he felt for the world they spun of magic and memory and self. And when they return to their secret world and she lays her horn across his secret heart, he sighs and the waters grow warm and loving and just a little greedy-- they gently grab at her legs and climb upwards in embrace, more vine than water, although the moment she wades back to the shoreline they fall away and let her leave in peace. Is there a name for this thing we are doing to each other? He quivers with a hundred answers until one finally steps forward. "We are playing with Magic." Magic? The coward! The word sits lamely between them. Magic is what first drew him to her but it is not what binds him. Magic is the waters they splash in but not the wings they use to fly. Oh, to be as fearless as Isra! To listen to his heart's sad song and put words to the melody. He looks at her and thinks the evasion must be obvious in his eyes, in the way his mind wilts a little. But he's chosen a course, and he sticks with it. "It lives in the chest," He shows her with his mind, for it is far easier than describing it, how the core of the wild magic lies in wait like a stone or a seed at the center of the self. How long could it sit there, unnoticed and provoked? "Just... observe it at first, and let it observe you." He channels his magic with a force he's never used before, reaching past her mind to read her magic itself, a great body of still water. He observes the way it glimmers in anticipation, and he senses that it is definitely different from his own, but in ways still unknown. Only later will he realize how the effort has drawn the strength and the sweat from his body. For now, all he is aware of is how his magic feels like fire, and hers like ripples on the surface of still water. It should hurt where they touch in bursts of steam, and maybe it does but more than that it satisfies. How often pain does that. Through their connection he shows her the world inside of him in hot waves of energy, so she may feel what it feels like when magic runs through you (his a white flame) and so she may hear what it sounds like when it sings. "Let it fill you from earth and air." His mind's voice is not like his own anymore. It is the sound of something between man and god. It is Eik, pure Eik, but stripped of uncertainty and full of magic in its place. The surface of the water does not yet break, but it jolts with wild ripples. Something wild and deep is rising to the surface. Does she feel it? Does she feel how powerful she is, how powerful she could be? It seems to build off his excitement-- or is that her excitement? Or the both of them, buzzing together like hummingbirds. He feels her magic swell in a beautiful wave. "There it is!" And then he withdraws, because only she will know what to do next, and it is a thing that ought to be done or not done alone. He keeps his lips pressed to her neck, so she knows he is there (always, Isra) but also for his own comfort. It suddenly feels very lonely inside his own mind. Eik takes this quiet moment to observe the bold curve of her cheek and his stomach clenches with words unsaid. He's still riding the wave of his magic, remembering the feeling of power seeping through his veins. It gives him the courage to say what should have been said earlier. "Or-- did you mean the other thing." He draws away from her only so he can meet her eyes with a level gaze. Silence suits the secret of secrets, and when he whispers it to her he shows her his heart, and how it blazes for her. "Not magic, but close. In stories I think they call it love." It is a funny thing- once he says it, the fear is gone. The school of fish scatter from the secret they keep and all that is left is love, raw and tender but strong enough to endure the sunrise, even when all other dreams fade into the day. "But that I can't teach you." His mind-voice sounds faraway as the magic flickers and recedes to the small place it inhabits in his chest. He blinks and the rest of the world comes back. They're facing the east, and before them the sky is tickled pink from a sun still below the horizon. "I'd like to see you in the sunlight," his words are said shyly still, even knowing her and being known as intimately as they do. He gestures forward, something almost like playfulness gleaming in his dark eyes. "Will you show me?" Isra does not see the school of fish and that one word between them. She does not see it at all. So she does not wonder if the letters are writ in sea silt and shells with drops of sea-foam and brackish water dripping from the bottom of them like ink. The shift of blue-green and silver-sided scales does not catch her eye when she looks away from the sea and to the sky, to a bird that soars and floats so lovely that she imagines it carries a little bit of Eik's soul (all the best parts, all the parts she looks at and calls 'mine'). Perhaps if she saw the fish and their hidden treasure she would have smiled and let all the parts of her creep out like snakes of moonlight. She would have watched them swim away through the waters and float like dragons across the sky and she wouldn't have dreamed of gathering back up the pieces of herself. Isra would have only blown them away like a million wishes and told them, live now, here in the soul of his magic and protect it always from the sharks and the rot..
Perhaps she would have risen from this strange world between them, laid her horn across his brown like a crown and anointed him with her touch like a god. Isra saw nothing and so she only blinks her eyes and walks between the inside of them and the outside of them and rests the hollow of her throat across his back. “Magic,” She echoes and presses her chest to the cage of his ribs and begs whatever sea of power it is that lives in her to reach out and crash over Eik if only to blend them two of them together a little more (until they are not two or even one but everything). Eik speaks again and she follows him back into the world inside of them. Each of his words seems a gemstone path across some lake deeper than the sea and she jumps from stone to stone as faithfully as a sleek hound. And when she realizes that she has followed him not to the place inside him but inside her Isra trembles and almost falls into that silver lake below her soul. And when he retreats she's still there peering into the magic as deeply as the magic is peering into her. They inhale and then exhale and her heart shivers like a doe in a arrow path.Oh! Isra whispers to the waters and the waters whisper to her and she's not sure who it is that speaks at all. There you are. I have been waiting. They coo together and the water reaches up like roots to twine about her horn and beg her to swim and to drown. Eik is the only thing that keeps her from sinking and she runs like feral thing over the gemstone path and across the shore and then into the world outside of them. “The other thing?” She asks and shakes her head as if there is a fly buzzing at her ear and her lips and yelling at her, listen closely, unicorn, listen closely now. If only she saw the fish! But he whispers in the world between them--love-- and Isra unfolds and restitches as she has never done before. Her magic rises up like a torrent, catching on the currents of that word (love, love, love!) and it crashes over her, sinks into her and devours her. And Isra, in the sound of that word, is remade. “Love.” She sighs and finds that way that it lingers on her tongue, like he title of an old book, a revelation. “You are already teaching me.” She pulls away and rests her horn across his brow like she would have done sooner if she only saw. “Eik.” She lifts her horn and presses her lips to the hollows above his eyes, his cheeks and then to that crease of his lips that sometimes seem so tense and other times as thin as paper. Isra almost says a million other things but the days peaks through and she sheds off her moonlight and her stardust and smiles back as him as playfully as a fawn. The magic inside her still rushes over her in waves and in that space of silence between them it whispers things and ideas and wildness to her like a song. Isra listens. The walkway at their hooves quivers and becomes a field of roses, pink and silken and heady. She looks down as the roses and then up at him, hoping to see wonder and that word love, love, love writ in the last silver-tones of night in his gaze. “Find me in the daylight then.” Her laughter floats out like bells and wind-chimes as she turns and runs through the flowers and then over the stones towards that streak of pink on the horizon. This time she is the one that leaves him a trail but hers is made of flowers and glass and glitz.